For more than 130 years, Sealy has been providing the world with some of the highest-rated mattresses; helping millions of people experience their best night’s sleep. As an authorized dealer of Sealy Posturepedic mattresses, we continue to be impressed by their dedication to excellence in manufacturing. Which is exactly why we offer Sealy brand mattresses at our Newington mattress store. We focused our search on only the very best when selecting which mattresses to offer our valued customers. Sealy, with its excellence in engineering, not only provides comfort beyond compare, but is guaranteed to last for decades while delivering support that is optimal for back and spine health. We’re proud to partner with the world’s largest bedding provider as they hold the same business ethics and goals as we do. With the belief that a good night’s sleep can actually improve your day, Sealy focuses its intent on designing and manufacturing beds and sleep products that offer every sleeper the best sleep possible. 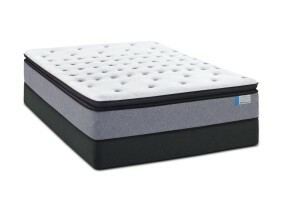 At Mattress for Less in Newington, we wish only for you to experience sleep in its best form. The type of sleep that you never even have to think about. The kind of sleep that we have all been envious of at least once in our lives. The kind of sleep we all deserve. Please visit our Newington mattress store, we’d be happy to answer any of your questions and help pick out that perfect mattress that delivers your perfect night’s sleep.